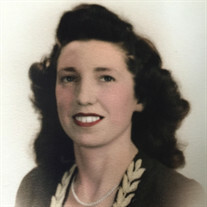 Rhoda Jane Fiore, age 101, of Lake Lure, NC, died Saturday, September 22, 2018, at Hospice House of the Carolina Foothills in Forest City, NC. She was a native of New Jersey and the daughter of the late Clarence Ormond and the late Jenny Johns Ormond. She was a member of St. Peters Episcopal Church in Essex Fells, NJ and was preceded in death by her husband Robert Vito Fiore Sr. and one brother Harry Ormond. A gathering of friends and family will be Friday, October 19, 2018 at 3:00 pm at the Rosedale Cemetery Chapel located at 408 Orange Rd. Orange, NJ 07051. The inurnment will take place at the Rosedale Cemetery. Online guest register at www.mcmahansfuneralhome.com.